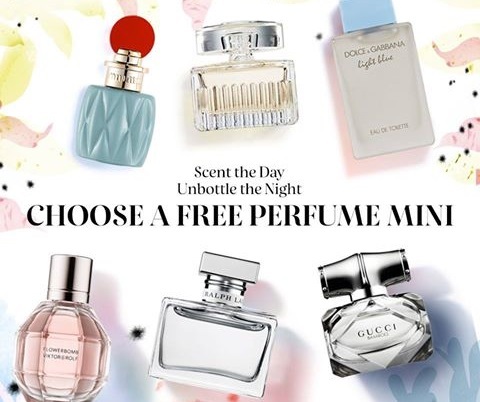 Sephora is offering a Free Deluxe sample of your choice of perfume (from a selection of 6) in this new promotion! Perfume options include: Miu Miu MIU MIU (0.25 oz), Viktor & Rolf Flowerbomb (0.24 oz), Gucci Bamboo (0.16 oz), Chloe Chloé Eau de Parfum (0.25 oz), Dolce & Gabbana Light Blue (0.15 oz), or Ralph Lauren Romance (0.25 oz). Enter the promo code DAYANDNIGHT at checkout with any $25 or more online purchase, while quantities last. Beauty insiders only. Offer available for a limited time. Also Sephora is offering triple the Beauty Insider points on fragrance purchases on now until May 8 for Mother's Day, in-store and online.